BRITE-PL (BRIght-star Target Explorer - Poland), is a mission planned to make photometric observations of some of the brightest stars in the sky in order to examine these stars for variability. 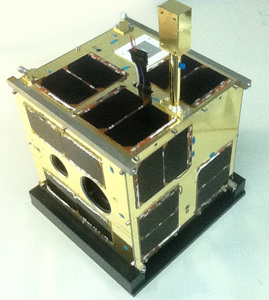 The observations will have a precision at least 10 times better than achievable using ground-based observations, and it is packaged inside a CanX-class nanosatellite. and was chartered with the research, design and construction of scientific instruments in the international research project BRITE-PL. Poland will run the research program with The Space Flight Laboratory of the University of Toronto which specializes in developing and manufacturing such small satellites. According to the agreement with SFL, the Canadian side will provide most of the components and subsystems necessary for the integration of the first satellite, the complete documentation, and will train a team of Polish engineers to properly carry out the integration and testing of the satellite before it is launched. In the case of the second satellite the number of components supplied from Canada will be limited. What's more, a large part of the subsystems will be developed in SRC PAS and manufactured in Poland.